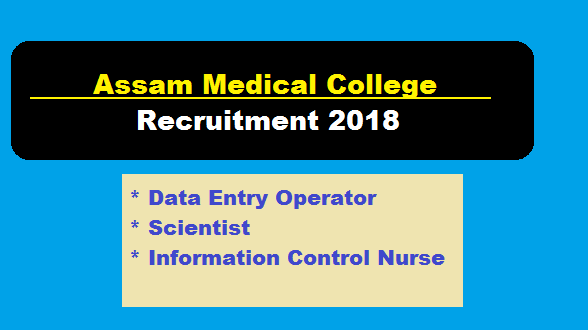 Assam Medical College (AMC) Recruitment 2018 – Scientists, Data Entry Operator & Infection Control Nurse Posts : Good news for Assam Government Job Seekers. Assam Medical College (AMC) has recently published a new Recruitment notification in the month of July 2018 and in this post we will talk about the this latest vacancy in AMC. According to the latest Assam medical College Recruitment 2018 notification, a walk in interview will be held on 18-07-2018 for filling up temporary vacant posts of Scientists II, data entry operator and Infection Control Nurse posts. This walk-in interview will be taken in order to engage manpower for various ICMR & CDC Project in Department of Microbiology, Assam Medical College , Dibrugarh. We have discussed more about this AMC recruitment in below. In this section, we will discuss in detail about Recruitment of various positions under AMC Recruitment 2018 with all the details and requirements. ESSENSIAL QUALIFICATIONS: B.Tech degree in relevant Engineering subject with 6 years R&D/Teaching experience in the relevant subject after B.Tech degree. ii.Additional Post-Doctoral research/training experience in relevant in recognized institutes. NOTES: i. Ph.D in the relevant subject shall treated equivalent to 3 years’ experience. ii. M.Tech in the relevant subjects shall be treated equivalent to two years’ experience. Educational Qualification: Candidates must passed Higher Secondary with experience in computer application and statistical software and 2 years’ experience in EDP work in Govt., Autonomous PSU, or Recognized degree in Computer Application/IT/Computer Science from a recognized institution/University. A speed test of not less than 15000 key depressions per hour through speed test on computer and typing skills in Assamese . Educational Qualification : Candidates must passed 10+2 Science with BSc. in Nursing/GNM from a recognized institute.Candidates with B.Sc nursing having relevant experience will be given preference. More details about AMC Recruitment 2018 can be found in this link.